J and I spent a week taking cooking classes in Chiang Mai once when we were kicking around Thailand for a few months. (We also spent a week taking foot massage classes in Bangkok. Both were pretty nice weeks.) We love Thai food and occasionally dig into the freezer and pantry to bring the scents and flavors of Thai cooking into our home. One of my favorite foods in Thailand was a rich, creamy noodle curry called khao soi. This is not a recipe for khao soi. You should definitely get yourself a bowl if you find yourself in Chiang Mai, though. THIS is a very simple recipe based on the Big Curry Noodle Pot recipe in Heidi Swanson’s Super Natural Cooking. 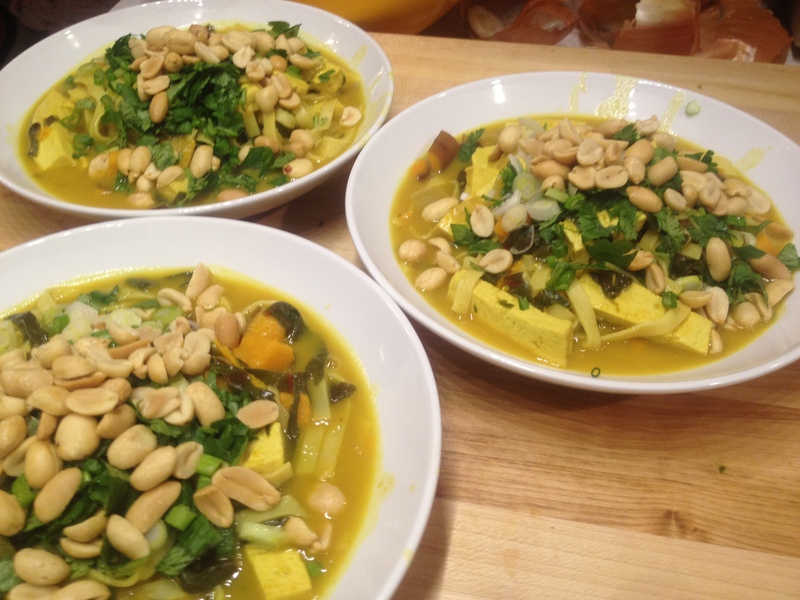 In Zippy Noodle Curry with Tofu, Sweet Potatoes and Chard, “zippy” refers to both the flavors and the speed of making the dish. (I’m funny, huh?) Saute an onion, 1 big cubed sweet potato (I steamed mine first, but I think it was unnecessary) and some chopped garlic in a glob of heavenly-smelling coconut oil with 1-2 Tbsp. red or yellow curry paste. Add a cubed block of extra-firm tofu and a few handfuls of chard leaves sliced to ribbons and stir to coat. Pour in 2 c. veggie stock, 1 can of lite coconut milk, 2 tsp. turmeric, 2 Tbsp. soy sauce, and 1 Tbsp. sugar and simmer until the sweet potatoes are soft. Meanwhile, cook 8 oz. fresh egg noodles in a separate pot. Add cooked noodles and the juice of a lime to the curry. Garnish with chopped cilantro, green onions and peanuts, and serve with chopsticks and a spoon. Thai chile flakes, soy and/or fish sauce, and lime wedges at the table will let everyone perfect the dish according to their own taste. This entry was posted in Asian Flavors, My Favorite Recipes, Noodles, Soups, Tofu, Vegan or Would-Be-Just-As-Good-Vegan and tagged cooking, dinner, food, lifestyle, recipes, soup, vegan, vegetarian on January 13, 2012 by emmycooks. Oooo, this looks delicious! I’m definitely going to try this soon. I remember having this in Chiang Mai and I totally forgot about it until now. Can’t wait to try making it! Thanks for sharing this great recipe! Isn’t it great to eat things that remind you of places you’ve traveled? Enjoy! It tastes good, too. :) Enjoy!